Shame On You If You Haven’t Been Out Enjoying This Weather! Wow! Upper 60s and low 70s the past few days. And it’s just early February. Think we will be back to reality by tomorrow, then another nice day, then some more not so nice days. The weather forecasters keep threatening more rain. We will enjoy what we can get!! Not much to say about the water flow. It has been non-stop since late December. For the past several days, we have seen four units going at an equivalent flow of a high two units. Every once in a while they’ll kick it up to the equivalent of three units. fish on the cerise worm under the big ruby, stripping a mini scuplin, or a red or black d-ribbed midge under the big ruby on the high bank side drifting out. 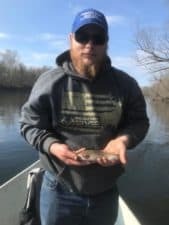 Ben is probably pointed on his first trip as he managed to bring in a beautiful 20 inch rainbow! Bill’s first on a fly rod was a wild trout and he followed up with several more, nicer size ones! Think he likes it. 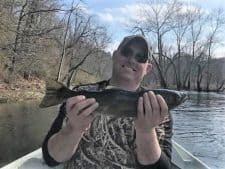 This entry was posted on Monday, February 4th, 2019 at 10:53 am	and is filed under Fishing Reports. You can follow any responses to this entry through the RSS 2.0 feed. You can leave a response, or trackback from your own site.